A good number of years ago, I ordered and received plans for your "Mai Tai". I had a thank you note and a picture of the finished boat which I thought had been mailed long ago, to your company. Recently, I found the note and picture, so I'll now thank you for the fine plans. From the time I started to build this boat, until the time I finished it, close to four years had gone by. I worked at it whenever I had a few hours of spare time. 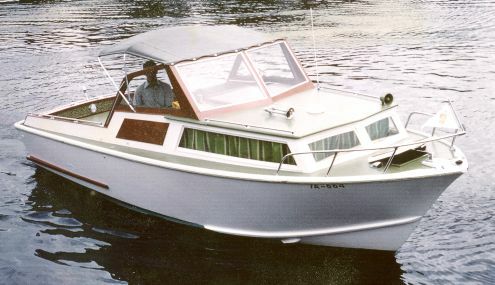 Enclosed is a picture of the finished boat. I received no help, nor did I want any. Any faulty workmanship could only be blamed on me. I powered it with an 130 H.P. Volvo stern-drive, and it handles beautifully. It banks nicely too. The booklet I received, enclosed with the plans, "Build It The Glen L. Way", was worth much more to me than the stated price of $1.00. I still have this boat, and I still receive very favourable comments. I have been and still am very pleased with the outcome. So thank you, even though many years have gone by.